Denzel is a young brown-haired boy who resides with Cloud, Tifa, and Marlene in Edge. Denzel's first appearance was in Advent Children, and is the focus of Case of Denzel, part of the tie-in series of novellas On the Way to a Smile. 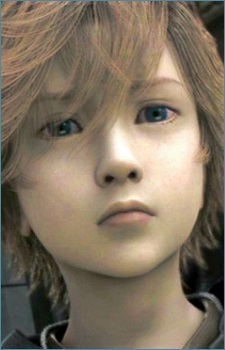 He is the son of a woman named Chloe and a Shinra worker named Abel. Reeve's mother, Ruvie, raised Denzel until her death. Eventually, Denzel is found by Cloud and taken to live with him, Tifa, and Marlene. Denzel is voiced by Kyōsuke Ikeda in Japanese and Benjamin Bryan in English. In Case of Denzel, Denzel's parents are killed by the collapse of the Sector 7 plate. Before dying, Abel entrusted Denzel to an inhabitant of Sector 5 named Arkham, and Denzel was subsequently raised by Ruvie Tuesti. When Ruvie died in the chaos resulting from the Lifestream burst, Denzel settled in the Midgar ruins with Rick, a new friend, helping to collect material for the construction of the new town Edge. Rick later left Denzel, who wandered and eventually comes across Cloud's motorcycle. Soon afterwards, Denzel suffered a Geostigma attack and collapsed and was found by Cloud. Cloud believed that Aerith's influence had led Denzel to his bike and, as a result, Cloud brought him home with him. In Advent Children, Denzel's Geostigma continues to weaken him to the point that he agrees to accompany Yazoo to be "cured." Denzel, along with other abducted children, are taken to the Ancient City of the Cetra. There, Kadaj manipulates them and they fall under his control, having been awakened to a "Reunion Instinct." After a failed rescue attempt by Cloud, Denzel and the other children are taken to Edge, acting as human barriers for Yazoo and Loz whom attempt to tear down the Midgar memorial. Denzel regains himself after Tifa protects him from Bahamut SIN and returns to 7th Heaven to be with Marlene. Denzel is cured of his Geostigma by Cloud using Aerith's purified water. He is last seen at the end of the film in a photograph on Cloud's desk depicting the entire main cast.